I was away for the last few days doing the Quinnipiac Bobcats games on the radio. So, I did not get to see the Rangers 5-4 victory over the Islanders. As a result, I basically need all of the info on the game: The good, the bad, and the ugly. Your input would be greatly appreciated! As for the Bobcats, they were off to Storrs, Connecticut to play in the Toyota UConn Hockey Classic. The Bobcats, after a long holiday layoff, won the tournament by beating a gritty Merrimack College in come from behind fashion with a 4-3 win in OT. In the championship game, the Bobcats took on the 11th ranked Air Force squad and really took it to them from the start and won by a score of 4-2. Associate head coach Ben Syer took over behind bench for head coach Rand Pecknold who was away for some personal reasons. Congrats goes out to the players and coaches. Great wins! Hopefully it will provide a carry-over effect down the stretch run in the ECAC. Happy New Year everyone! Over and out! Update: I will be away Friday and Saturday doing some more Quinnipiac Bobcats games on the radio. I will answer any comments when I get back! 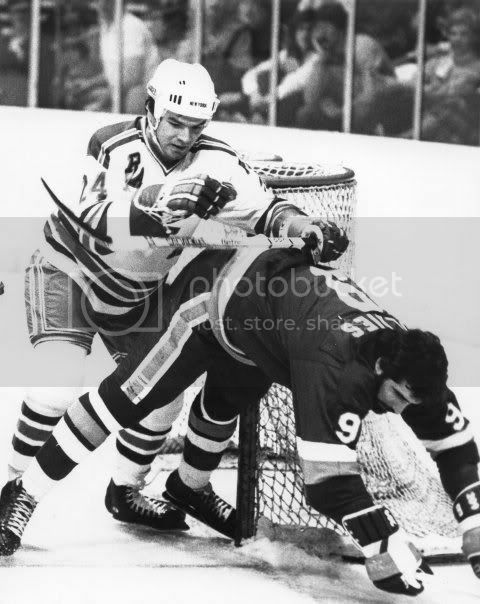 In what I felt was a critical game at this point of the season, the Rangers dropped a 4-2 decision to the much despised New Jersey Devils (Despised or not, they play some solid hockey). 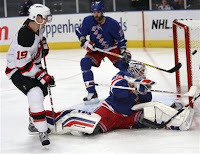 It all started wrong for the Rangers with a PP goal against, followed by a shorthanded tally by the Devils (Shorthanded... again?). From there, it was "chase the score" all night long! Where do we begin with this one? I think I will start with the post-game presser by Coach Renney. Without names being mentioned, he let everyone know that he's not pleased with a certain few. I think we all know who he's talking about... and he's right! The so-called "stars" have not contributed like the Ranger brass or faithful had envisioned. If you, as a fan, believe otherwise - then you can easily be sold some ocean-front land in Kansas City! When your 6-12 players show more heart and energy night after night (As my former teammate Dave Maloney mentioned) then you got a problem... and it's a big one at that! Along with the usual no scoring was again a lousy PP, giving up another shorthanded goal, and minimal physical play... it just compounds the problems even more when your top players are not playing very good. I heard from people that they want a change in coaching... sorry, but this is not a coaching problem. This is a player problem. No excuses, no stories, no dreams will ever make me believe different. The players got themselves into this, now they have to dig harder and find their way out. One other thought, I never would have believed this but - Jagr, Shanahan, Straka, and even Sean Avery all look pretty good to me right now. How about you? Also, I will be away for a while this week doing some more Quinnipiac Bobcat hockey games. The days that I will be doing the games are as follows: Monday, Tuesday, Friday, and Saturday. Feel free to check out the link below and give the games a listen. Over and out! Ah, where do I start with this one? The New York Rangers made an awesome impersonation of jolly old St. Nick and gave out an early Christmas present to the Washington Capitals on Tuesday night. I don't really want to re-cap the game, because the Blueshirts have left me in a bah-humbug sort of mood. How can you squander a 4 goal lead against a depleted Caps team? Let's start with terrible giveaways. Which one you ask? Well, there were so many that I'd run out of space if I went over them all. The no hit rule? Yeah, that's funny. Let's see... you have one of the most exciting players in the NHL, in Alexander Ovechkin, and you let him run wild over you. Sorry, but a couple of hits by Dawes and Staal don't do it for me. Ovechkin plays on the edge and is physical himself - which means to me that he's fair game. If you live by the sword, you die by it too. Instead, Ovechkin showed the crowd at MSG what a true leader does. He hit, he hustled, and he scored (the last one was the key). It also helps when a team lets you off the hook and doesn't bury you when it was 4-0. However, I'd just like to end this on a positive note, wishing all my readers a Merry Christmas and Happy Holidays. Over and out! The New York Rangers, fresh off of a 3-2 win over the LA Kings, waded into Shark territory and basically did everything they had to in order to take down of the NHL's best teams. At the beginning of the game, the Rangers had to withstand early penalties that gave the Sharks a 2-man advantage and a subsequent 2 goal lead (Mara's penalty was crap). From there, I thought the Blueshirts were by far better team in this game. The team was led by not the so-called "leaders", rather they were led by players like Ryan Callahan and Brandon Dubinsky. These two took charge after Zherdev cut the lead to one - with a nice 5-hole shot on a 2 on 1. You have to appreciate Ryan Callahan. Night after night he puts it all on the line for his team! He hustles, hits, and provides energy like no other does on this team... and for what? Less than a million? Anyways, his hustle lead to a goal where he charged to the net and backhanded a rebound off of a Dubinsky shot. Callahan's efforts again cut the lead back to one. Previously, Patrick Marleau bumped the lead back up to 2 on a goal that Henrik Lundqvist got caught napping on. At 3-2, the Rangers took over in the 3rd and it really looked like they were toying with the Sharks on numerous shifts throughout the 3rd period - but, they still could not find the net. In the end, the Rangers were not rewarded for their efforts. As I mentioned earlier, the "leaders" and "stars" were missing in action. Guys like Dubinsky, Callahan, Betts, etc. were the reason why I thought the Rangers outplayed the Sharks for most of the night. I had some trepidation going into this one, but was pleasantly surprised how the Blueshirts took it to the Sharks without their stars providing any offense. On the downside, the scoring is still a major problem. Something has to give in sooner or later. Trades? Someone getting hot? I don't know what the answer is, but it's been a problem all year! Oh, and one more thing... I am so glad that the Mats Sundin saga is finally over. We can finally take the "Swedish Meatball" off the menu once and for all. Hey, I know he's good, but where does he get off playing with the NHL like it was his own toy? Have fun in Vancouver Mats! Over and out! With the Mats Sundin drama finally winding down (hopefully), the New York Rangers have quietly taken the first 2 games of a 3 game Western Conference road trip. In Anaheim, the Blueshirts played one of their best overall games in quite sometime, with a 3-1 victory over the Ducks. I felt that the Rangers took away the passing lanes and really clogged up Anaheim's offensive attack. Henrik Lundqvist finally had an easy night turning away just 19-20 shots. The scorers for the Rangers were: Christ Drury, Nigel Dawes, and Nik Zherdev (who was awarded a goal when Anaheim pulled their goalie and took down Zherdev on a breakaway). You gotta like the effort by the Rangers in this game, outshooting the Ducks 30-20. The Rangers really deserved this one as they played a perfect road game. Smart and good defensive play usually gives you a shot at winning on the road. Now, on to LA... what a difference a day makes! The Rangers were outplayed for the most part in this game. But, in the end, they don't draw pictures on a score sheet and the final result was a 3-2 OT victory over the LA Kings. If not for the super, and I mean super, effort of Steve Valiquette in net for the Rangers - it would have been a blowout for the Kings! I really don't know what happened to the Rangers, as they left whatever legs they had behind on the ice in Anaheim. No excuse for it. 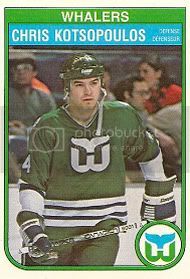 Patrick O'Sullivan opened the scoring up for LA, with Chris Drury tying it up late in the 1st on a shot that goalie Jason LaBarbera wishes he could have back. The Rangers were lucky to escape the 1st with a tied score. The Rangers then took a 2-1 lead on a weird and wacky play on the PP. Sean O'Donnell slapped a broken stick towards Michal Rozsival, who was manning the point on the PP. Rozsival, who had the puck at the time, was then awarded with a penalty shot. Rozy made the Kings pay with a nice fake and backhand that would of made Alexander Ovechkin proud. Nice job Rozy! In the 3rd, the Rangers got caught running around and staring at the puck when Dustin Brown tied it up at 2 a piece (Boy, is Dustin Brown a player). For the rest of the 3rd period, the teams tried but could not end it in regulation - that's where Michal Rozsival steps in. Rozsival ended it in OT with a blast from the point that would not be denied. Rozy's laser found the top right corner of the net and left a stunned LA Kings crowd and a jubilant Rangers squad. 2 for 2 so far with the big bad monster, the San Jose Sharks, just ahead on Saturday. You would think the drama of the Sundin decision might have some effect on the current roster, but so far so good! Good game in Anaheim, not so good in LA... but still 2 wins. What's to complain about if you're a Ranger? Over and out! After being totally beaten down by the Devils on Friday by a score of 8-5, The Blueshirts escaped again with a shoot-out win over the Carolina Hurricanes. There's no need for me to discuss the Devil game in detail. We all saw what happened (Devils basically kicked sand in the Rangers faces). I'd rather talk about the victory over the Hurricanes - as well as the positives. Henrik Lundqvist, who's been left out to dry quite a bit lately, was back to his regular MVP-like self. Carolina outshot the Rangers 31-29. Again, I can't stress enough, this team goes as the King goes. Plain and simple. I just wish more players would step up and be as professional as Henrik is. The game itself was rather uninspiring as both team played it close to the vest, almost hoping for OT or a shoot-out. 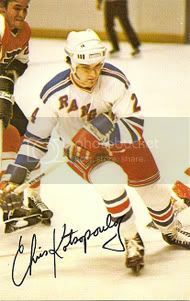 The Rangers opened up the scoring on a nice passing play by Zherdev to Gomez, finished off by Naslund on... hold it now, a PP goal?! Woo-hoo! Carolina then tied it up on a Tuomo Ruutu goal just 22 seconds later (nothing like taking the air out of a balloon). Then, Blair Betts took a nice pass from Freddie Sjostrom, on a shorthanded chance, and buried a snap shot for a 2-1 lead. In the 2nd, Ray Whitney blasted a wristshot past a screened Lundqvist to make it a 2-2 game. In OT, Lundqvist as usual had to make the harder saves to get the Blueshirts to a shootout. In the shootout, Naslund, Zherdev, Sjostrom, and Gomez all missed their shots. As a result, this allowed Drury to play the hero with a nice fake and backhand past Cam Ward. Lundqvist then stymied Justin Williams on the final shot, for the win. It's nice to get the 2 points, but the leaders and top lines need to pick it up. When the 3rd and 4th lines show more passion and better overall play - something is wrong. As for this road trip to California... boy, they had better be rested and ready to play at the puck's dropping. The Ducks and the improving Kings will be tough. Let alone going into San Jose (Boy, are they good)! The Rangers are going to have to play smart, intelligent, and physical hockey on the road trip. Over and out! Oh... and by the way. Sean Avery's available now? Hmm. Scott Gomez scored just 18 seconds into the OT period and bailed out the New York Rangers with a 3-2 win over the Atlanta Thrashers. Gomez, who's been quite feisty lately, slammed home a rebound off a Markus Naslund dump in on goal. 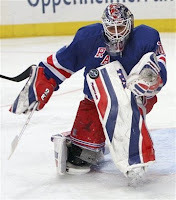 The Rangers once again relied heavily on the goaltending, however this time it was not Henrik Lundqvist's... it was Steve Valiquette's outstanding performance that gave the Rangers the much needed victory. Atlanta tied it up on a terrible line change by the Rangers (Where's the hockey IQ?) resulting in the 1st career NHL goal for Joseph Crabb, a former Rangers draft pick. Not only was it his 1st goal, but it was a great shot! Ryan Callahan then crashed the net and the puck bounced off of his upper body to give the Blueshirts a 2-1 lead. I was thinking, maybe... just maybe the Rangers would win this one in regulation time. But, no way! Why do it the easy way? Ilya Kovalchuk snuck by a few Rangers, who were caught looking at the puck, and Kovalchuk made no mistake with it and pounded it by Valiquette (Wouldn't he look good in a Rangers jersey). From there, both teams looked to play a safe period of hockey and get to the OT session or the shootout. My take is much of the same for the Rangers: low scoring, or no scoring - which ever you like better. And, of course, good goaltending kept them in long enough for Scott Gomez to win it in OT. Wow, It's hard to believe it wasn't a shootout this time! A decent win considering the past few games, but let's not do cartwheels over this one. There is much work still to be done in Ranger land. Over and out! The New York Rangers were shutout at MSG by a score of 3-0 at the hands of the Calgary Flames. For a while in the 1st period, the Rangers played even hockey, for the most part. The Flames, however, scored on a terrible line change by the Rangers as Jerome Iginla banged home a rebound past Henrik Lundqvist. I thought, "Okay, it's only one". But what I did not expect was that the Rangers biggest problem would creep up on them again: The lack of scoring. Which, anyone who's a Ranger fan knows all too well. Forget about the 2nd and the 3rd goal (Another short handed goal, by the way). The real problem here is the offense! With all of the changes made over the last 2 seasons and the high priced acquisitions that were supposed to be the bulk of the offense... all I can say is that: you get the most ice time, get payed the most, and get the most free passes from the fans and the media. Thus, when you aren't pulling your weight - you should take the heat. I will not name names, but it's obvious... isn't it? Look, I love the Rangers and I want them to do well. But, what I've seen lately has me a little worried about the long run. I mean, how much can a goaltender take when he steps on the ice night after night and he thinks he has to stop everything? 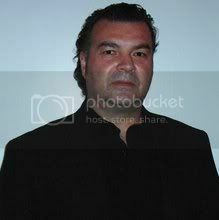 When are the players, who the Rangers desperately need to come to the forefront, gonna contribute? I'm sure that Glen Sather is wondering right now, along with Ranger fans. I don't want to take anything away from Calgary, but jeez... can someone start scoring? Please? Over and out. After a great shoot-out come from behind victory against the Pittsburgh Penguins, 3-2, The Rangers headed north for a showdown. The showdown was against a team that, I feel, will be a force to be reckoned with come playoff time - the Montreal Canadiens. Boy, was this a downer from the start. Montreal just looked like the hungrier and faster hockey team. On the flip side, the Rangers looked like they were just standing around, had no energy, no hustle, and another slow start left Henrik Lundqvist out to dry. Sorry, there is no way to sugarcoat this one. The Habs got 2 quick goals by Kostitsyn and Begin within a span of 55 seconds, midway through the 1st period. With the Rangers down 3-0 after the end of the 1st period, something very interesting happened. Lundqvist, instead of leaving the ice, headed to the bench and had words with coach Tom Renney. What was said? I don't know, but it sure didn't look good! For Lundqvist, it has to be frusterating night after night watching the Rangers get off to such slow starts. I think the fans are feeling the same, Henrik. 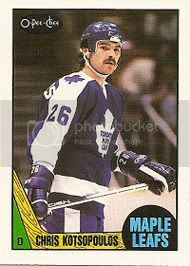 Getting back to the game... Montreal did whatever they wanted for the most part with the Rangers looking like pylons. Standing and watching... admiring the play of Montreal. The shots were 39-20 in favor of Montreal... and the box score was filled with minus players up and down the scoresheet. With Calgary coming to MSG, the Rangers had better get this one out of their system... fast. I also wanted to mention the nice tribute by the Canadiens before the game showing off some of our Ranger greats. It was nice to see, especially seeing my good friend Ron Greschner taking part in the ceremony. Does someone want to tell me why his jersey isn't hanging up with the other Ranger greats yet? Over and out. Oh, and I'm off to Quinnipiac on Friday doing the broadcast against Providence. The Stanley Cup will be present at the Banknorth Sports Center! Check it out if you're in the area!